These Irish costume jewelry earrings state Irish Pride and feature Celtic knot and shamrocks. The costume earrings are made from re-purposed bottle caps. 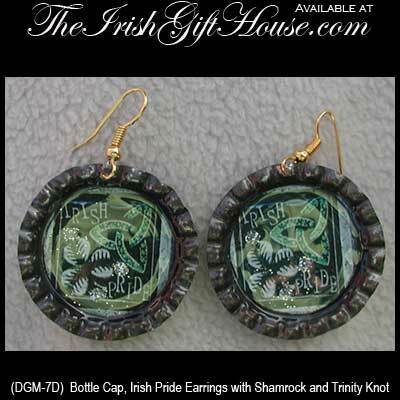 These silver tone metal costume jewelry earrings a glittered Irish pride motif, that is enhanced with the shamrock and Trinity knot, as bottle cap art; the custom art work is sealed in acrylic. The costume jewelry Irish earrings measure 1 3/8" in diameter and have nickel free fishhook wires. The Irish costume jewelry is made in the United States by Doná Fashion Jewelry and is received with Celtic knot and shamrock history cards, complements of The Irish Gift House.